I build custom desktop here and there, been using system info tools like speedfan, coretemp, aida64(everest), but what I love most is speccy, as it's been my partner ever since 2004.... 'till now. after installing win8.1 pro 64bit on QuadCore AMD A8-5600K,Gigabyte GA-F2A85XM-HD3, w/RAM 4gb. Speccy reported a slapping 70° C ...on CPU temp ..I immediately, shutdown PC ..(as any custom PC builder would do) ..I don't want to fry my box.. I checked and reinstalled heatsink, reapply appropriate amount of thermal paste, rebooted, still getting way over normal/average/acceptable idle temp. ....spent 3 weeks figuring it out, I even bought a new COOLER MASTER HYPER 612PWM CPU COOLER. but still the same. Then, I said, "to hell with it, I will let it run for 3 hours" ..boom!! !, suprisingly, it did not melt. I played max setting on H.O.N , dota 2, heck I even played Injustice with it. not max though, but yeah.. for hours...but did not fry the box.. so I begin to suspect the reading is inaccurate. I just want to share this because, I want this fix periform. I have a similar issue on a Lenovo laptop. It claims consistent temp readings over 100°C. I am quite certain that is not the case. I have the same problem.am running Dell XPS 8700 win 8.1 64bit Intel Core i7-4770 CPU @ 3.40GHz.Speccy tells me the motherboard Temp is 128C If I refresh same thing if I close and reopen SOMETIMES it will read 28C(correct Temp) According to Dell if the mobo temp was 128C the cpu would immediately SHUTDOWN.I tried an uninstall reinstall but same thing.this must be a problem with Win 8.0&8.1? a/c others are having this problem with different mobo's? I'm sure the Dev Team are aware of these incidents as they do read all the posts. Hopefully they will have some advice soon. All I can add is Speccy for me (Win8.1u1) shows an average temp of 38 degrees across the 4 cores of my i5-3570, and 28 degrees for the Gigabyte G1.Sniper M3 (Z77 chipset) mobo. Still getting these 128c bogus readings on the mobo,if I refresh SOMTIMES it shows the correct reading(38c)This discussion originally started in May/2014 when is Piriform going to correct this Issue? Not that it helps you, but it may just be an unlucky partnership of Speccy and your mobo not playing nicely together. You have done all the obvious stuff, and generally others are not reporting temp problems across the board, so sadly, it'll be a wait & see for the next version to see what the Dev team do. This indicates very strongly to me to that when you refresh then Speccy receives the correct information which it never received at first. Either your hardware or your operating system could be the source of intermittent data quality. May I assume that The same Speccy is looking at THE VERY SAME CPU - if not then your statement is obviously false. Less obviously, perhaps you also the same "Quality Assurance" problems with all your DELL motherboards. Perhaps bad fan error messages and bad network adapters are the least of your problems. I suggest you try an alternative to Speccy for measuring your CPU temperature. You may find that the alternative also gets results that change upon a refresh. Just recently switched to an HP Pavilion. Win 10 64bit, AMD A10, 8gb Ram, HD 7620G graphics. I have Speccy on my Desktop and it runs fine. Also runs well on my wife's laptop and my old laptop. However, on this machine it reports my CPU is running at 100 - 101 Centigrade! Had me worried, but I'm sure the PC would have issues at that temp if correct. 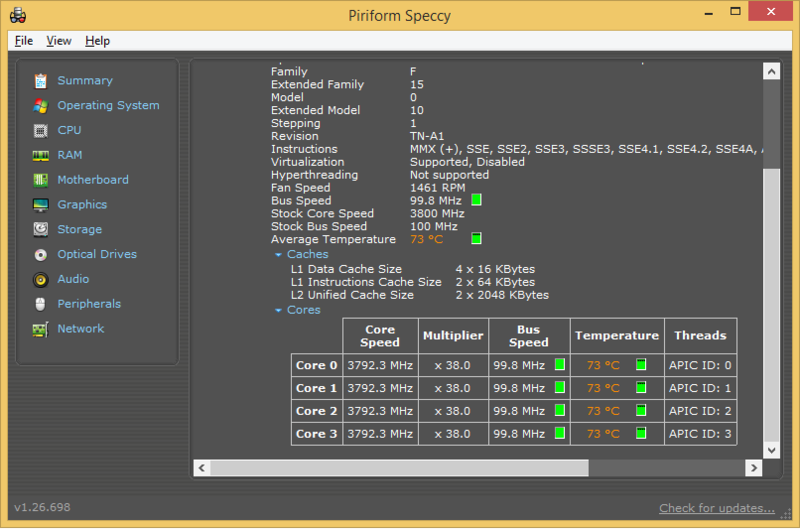 Installed Speedfan and it reports the Core is running at 46 - 52 centigrade! Now that seems to be more in line with the laptops actions. Hope they will fix it as I too love Speccy.